Virtual Reality. 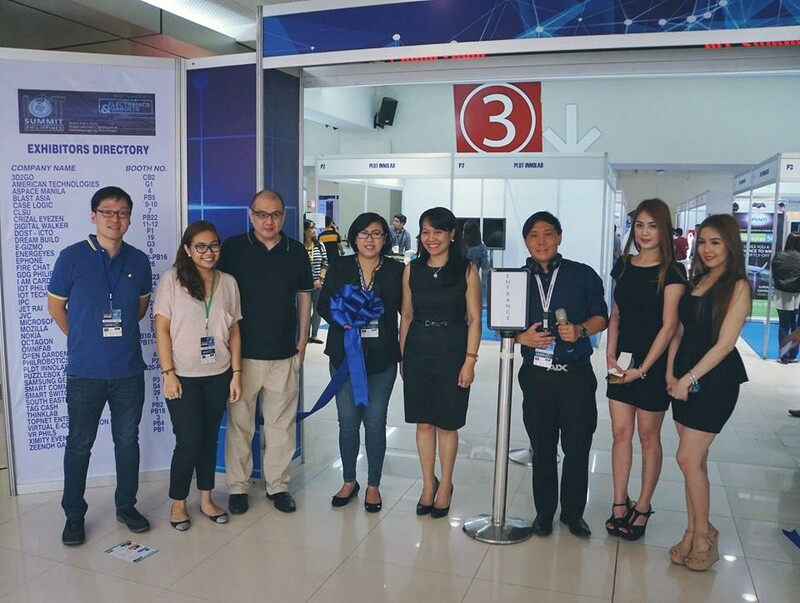 Latest wearables, Connected home devices, Smart Toys, 3D printing, Cloud Services, Robots, Ironman, BB8 Droid, Wifi Electric Socket and Theta Camera were few of the many featured tech gadgets and solutions at the recent IoT Summit Philippines held last March 4 and 5, 2016 at the Megatrade Hall 3, SM Megamall, Mandaluyong City. The first Internet of Things (IoT) Summit in the was the culminating feature in the 3 part event that included a Bootcamp and a Hackathon in partnership with ThinkLab which introduced and taught building hardware (IoT) projects using Gizduino board provided by e-Gizmo, and cloud computing solutions provided by Microsoft Azure held at ASpace_Palet Express. 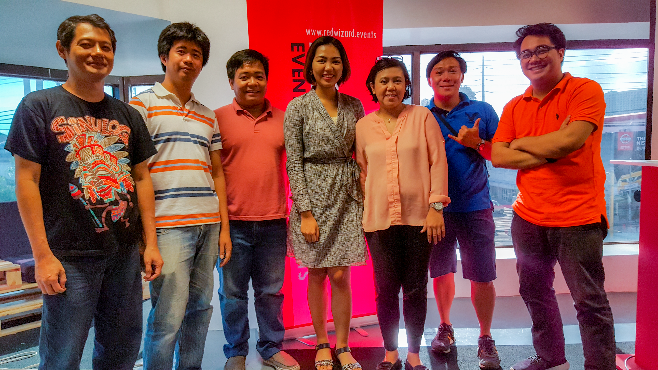 Elaine Cedillo, the IoT Summit over-all project head with Diego Jose Ramos Co-Founder of Redwizard Events, members of PhilRobotics and Thinklab, the trainors and facilitator of the Bootcamp. 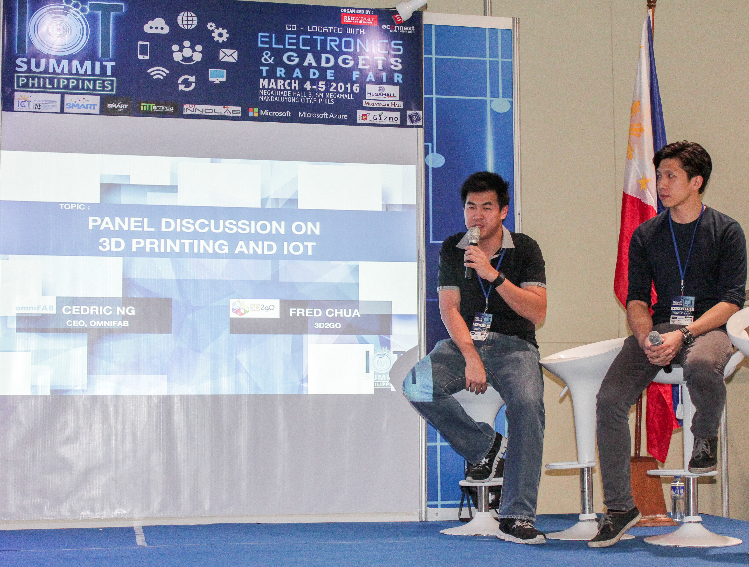 Aside from featuring Smart Home, Smart Toys, 3D printers, Virtual and Augmented Reality technologies, the Summit opened the event with a conference having some speakers who are the prime movers of IoT Technology in the Philippines and abroad. During the ribbon cutting, a sign that the IoT Summit is officially happening. In photo : (L-R) Representative from PLDT Innolab headed by Kristine Dara Calayag EverJuan, Mike Tagorda, Founder of MTTagorda Management Consultancy, Ms. Elaine Cedillo the Project Head of the IoT Summit Philippines, Ms. EmmyLou Versosa Delfin, Program Manager, DOST-ICTO, Diego Jose Ramos, Co-Founder of Redwizard Events and Horsepower.ph and friends from Smart Communications. Mr. Marthyn Cuan, the Chief Digital Officer of MERALCO gave the opening keynote followed by Gio Abaquin of Smart Enterprises that discussed the roadmap of IoT in our country together with Leo Lirio of IoT Technology Inc. While Joel Garcia of Microsoft Philippines, Teo Pohsoon from Ultimaco Singapore, Lowell Tortana of Nokia, Yue Savage of Impinj USA and Dr. Hernando Delizo of Clinica Manila also shared their expertise on Big data and Security, 5G in the Philippines and Connected Health respectively. A panel discussion on Wearables and 3D printing were also the point of interest of the attendees. Showcasing the current and future plans on the said industries esp. that more and more multi-billion companies such as Samsung and Facebook are looking into the VR tech. 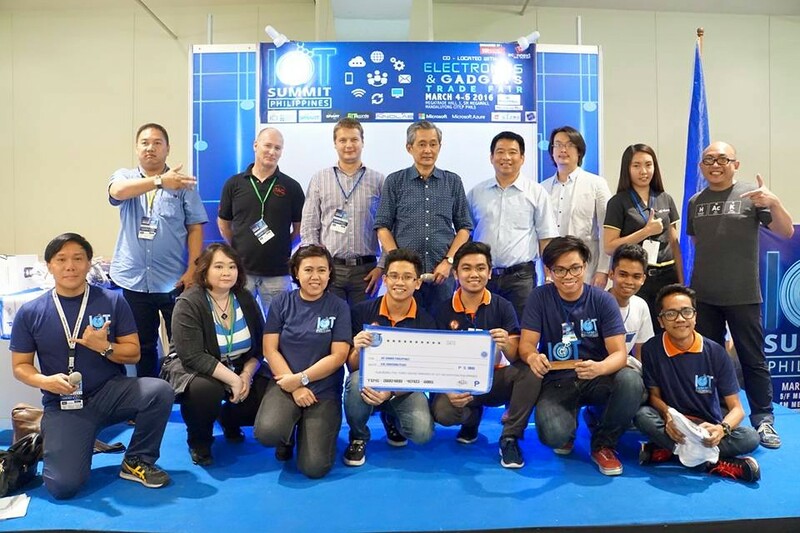 Several projects from the hackathon were part of the exhibit and the highlight of the event including the group demos and judging was held the next day, March 5. Projects that were presented included a pet feeder, posture tracking wearable, bicycle safety (signal light and theft tracking), NFC child tracking, irrigation management, fire alarm system (smoke detectors), pollution detectors, e-waste management, electricity monitoring and metering, motion and sound sensing smart plugs, and NFC / RFID security system. The groups presented their demos in the plenary and the panel of judges vetted the projects with innovation, impact, design execution, business potential, and demo as metrics. Project Bantay of Team Biotics emerged as the Grand winner. It is a simple home/office security system built on motion sensor device that can be manually activated. When triggered, options are 1. Emit an audible and/or visual alarm, 2. Take picture of the area where the event was triggered, and 3. Send SMS/MMS alert to a preconfigured smart phone and/or email the captured picture with tag to a dedicated email account. This system is also equipped with an NFC/RFID Door lock which is accessed by a tagged NFC key/card. 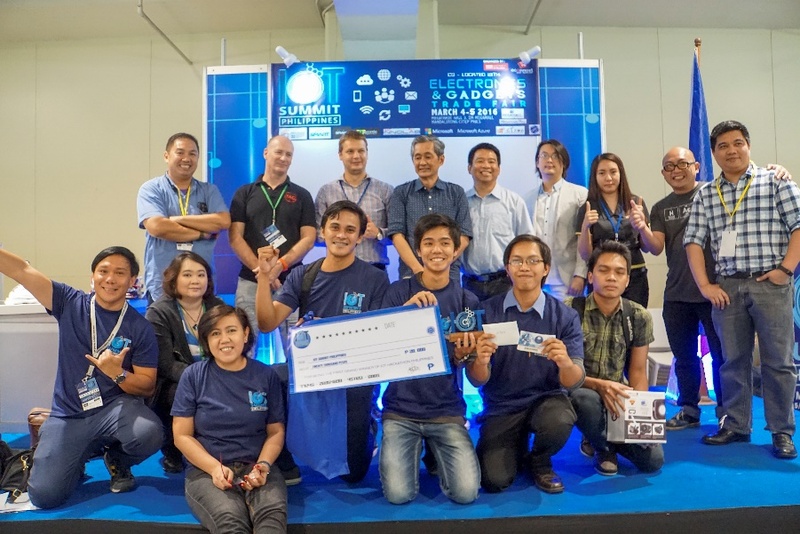 The esteemed judges headed by Mr. Mon Ibrahim , Deputy Officer of the DOST-ICT, joined by Joey Limjap of PLDT, Teodor Drobcsak from Nokia, Karlo Samson of I.T. 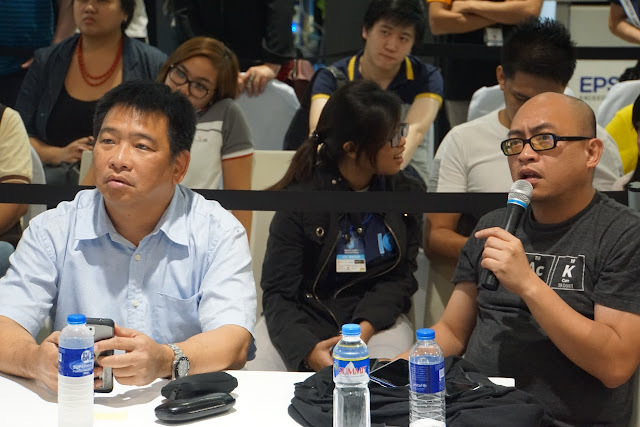 Journalists Association of the Philippines , Mark Vernon, Founder of TAG Cash, , Anderson Tan of Zeenoh Games, Engr. 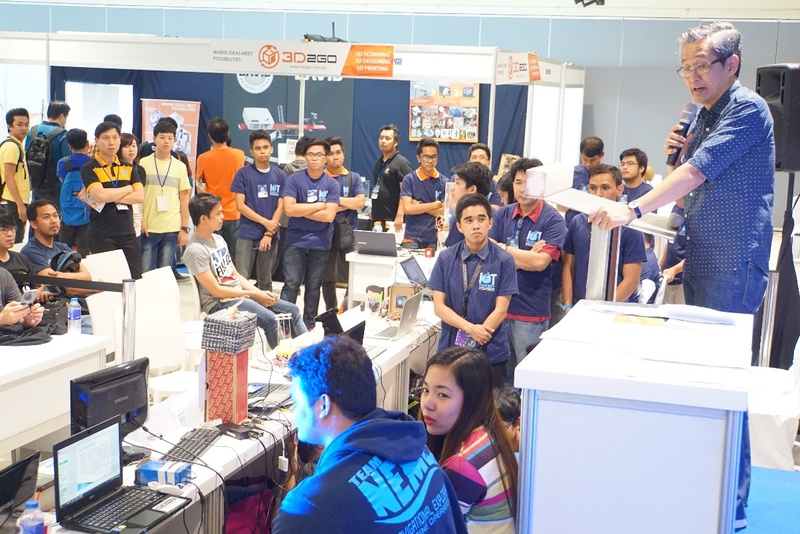 Roma Mercado of e-Gizmo Mechatronix, and Paul Pajo, Tech Evangelist of Smart DevNet vote unanimously for Bantay. 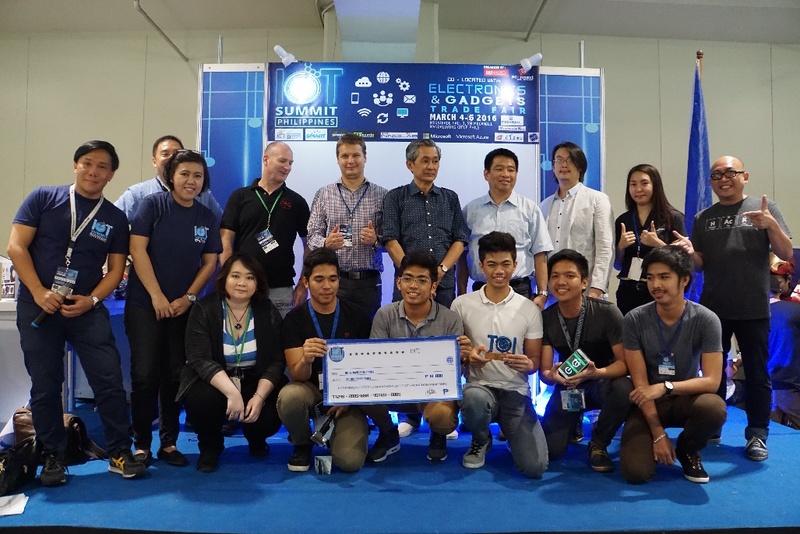 With the growing demand of Internet of Things technology in the Philippines and basing on the success of the first IoT Summit Philippines, Elaine Cedillo, the head organizer of the event said that they are looking forward to stage another IoT Summit and Hackathon next year. “We want to push further to continue to educate the different business and industrial sectors until we reach our goal by 2020 that everything will be connected and build awareness about the convenience brought by this technology” Cedillo continued. “We are also happy to get the support of from our event partners, community partners and exhibitors such as ASpace, Thinklab, Philrobitics, VR Philippines, IoT Technology Inc. Nokia, GDG Philippines, Samsung, Omnifab, Dreambuild 3D printing, Ephone, Digital Walker, Case Logic, CameraHaus, Essilor, Ximity Events, FireChat to name a few” Diego Jose Ramos, the co-founder of RedWizard Events Management continued. “Internet of things is really the next big thing and we do not want the Philipines to be left behind” Ramos emphasized. 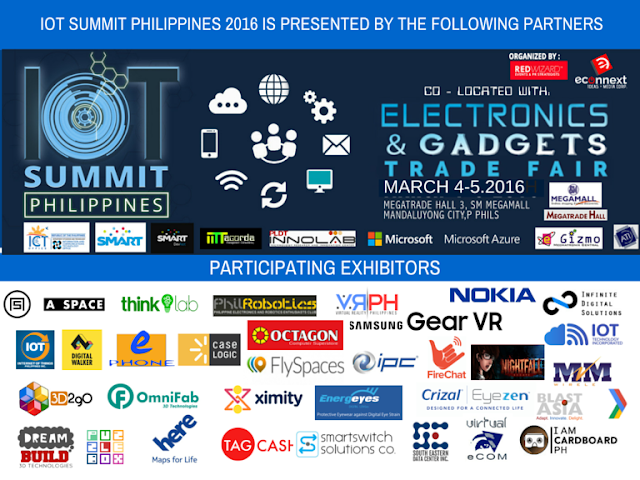 The IoT Summit Philippines is in collaboration with DOST-ICTO and supported by Smart Communications, Smart DevNet, PLDT Innolab, MTTagorda Management Consultancy, e-Gizmo Mechatronix, ATI and Microsoft Philippines. A follow up training on Gizduino board by Thinklab, Redwizard Events Management and EConnext Ideas and Media will be held on April 2, 2016 at the Ayala Technohub in line with the celebration of the International Arduino Day. There will also be exhibits of IoT and Robotic projects and extensive talks from respected speakers and makers about the use of Arduino boards. So if you missed the IoT Bootcamp last February, you can still learn about IoT and Arduino. There will be an IOT crash course and project building workshop in the afternoon (exclusive for All-access pass holders only).